Mark J. Jones (1995). Char Davies: VR through Osmosis. At SoftImage in Montreal, the reception area in the corporate headquarters boasts a long spiral staircase which majestically takes visitors from the ground floor to the upper reaches of the offices. There, on the other floors of the building, where one can get a clear view of the Montreal skyline, sits a handful of its 230 employees working on their next project: programmers, marketers, artists — and one very content black Tibetan Mastiff puppy. "That's Mystic," says Char Davies, director in charge of Visual Research, as she scruffs him behind the ear. "He's our mascot. He reminds us not to take ourselves too seriously." Indeed, SoftImage, one of the world's most renowned computer graphic software development companies, is at a point where it has every right to take itself very seriously. Before merging with Microsoft in 1994, the company had already made its mark in the industry as one of the few developers which made graphics tools for artists. Give the artists the right tools, their mandate implied, and the art would begin to follow. Microsoft stepped in recognizing that SoftImage had set itself apart from other companies as the only one that had managed to blend technological wizardry with artistic creation. "I feel it's really important that along with pure technological development, there's another development that goes alongside in terms of aesthetics and content," says Davies. "My role in visual research is to 'push' the tools in terms of their expressive capacity. If this technology is to convey a full range of human emotion, then its aesthetics should be evolving along with the actual code." Enter Osmose, SoftImage's new immersive virtual reality installation, presented at ISEA '95 at the Musée d'art contemporain in Montreal and developed by a team headed by Davies that includes Georges Mauro (graphics), John Harrison (custom development of virtual reality software), Rick Bidlack (musical composition and programming) and Dorota Blaszcak (sound design and programming). According to SoftImage documentation, Osmose is a fully-immersive and interactive virtual environment which uses stereoscopic 3-D computer graphics, a head-mounted display (HMD), real-time motion capture and live stereoscopic video projection. Osmose was created with SoftImage 3D modeling and animation software and runs on a Silicon Graphics parallel processing Onyx computer. Osmose's setting is a series of nearly a dozen virtual worlds in which the user explores and becomes a part of: a world of text and literature through a fog; a forest; a clearing; a pond; a leaf; one can journey inside the ground; into an abyss; into a world of lines of code. "Osmose is about our relationship with Nature in its most primary metaphorical sense, i.e., the inter-play between the exterior world-space of nature and the interior world-space of self', writes Davies. "Osmosis: a biological process involving passage from one side of a membrane to another. Osmosis as a metaphor: transcendence of difference through mutual absorption, dissolution of boundaries between inner and outer, inter-mingling of self and world, longing for the Other. Osmose as an artwork seeks to heal the rational Cartesian mind/body subject/object split which has shaped so many of our cultural values, especially towards nature." I don my HMD and the assistant wires my chest and back with interface devices. Osmose is activated and I am transported to a 3-D Cartesian wireframe grid. "Relax, " they say, "get used to the space and the interface. " I look around to see that the grid extends to infinity in all directions. I inhale and gradually begin to rise; if I lean forward I move forward. Lean back and I move backwards. I'm flying, I am an enigma, I have no physical form, yet I am whole. I am an "immersant. " An "immersant," Davies explains. "The goal of this work is to re-embody the participant, who I have named an 'immersant.' I think it's a good word, we went through a list of about sixty words on what we should call them: user, participant? I think immersant is suitable because you are bodily immersed, and it was this spatially immersive quality that interested me in VR." Another way of re-embodying the immersant is through the interface Davies has chosen. Gone are the cumbersome datagloves and joysticks: in Osmose, the immersant controls his/her movement with breath and balance. Davies explains: "I wanted to get away from interface methods that were directly manipulative, and in this work — as opposed to many other VR pieces — I was looking for alternatives to getting into that space and controlling or dominating things, where the user is reduced to a disembodied eye." Gradually, a thick fog begins to rise over the grid. Leaves appear through the fog, and the grid is gone. Everywhere I look there are more leaves. I move through them, in them, around them. I fly over them, yet more appear above me. Am I lost? No, I am surrounded by a thick forest of leaves of all shapes and colours. It is dusk one minute, night the next. I float as if I am swimming deep in the ocean, yet I know I am in the air. Much of Davies' work has a fluid, enigmatic quality to it. She relates that her interactive approach to VR comes from her experience as a scuba diver. "There are many, many correlations between diving and VR. One of them, the most simple, is that when you're diving you have to put on all this heavy stuff. In VR, people complain [that] you have to put on this and you have to put on that, you have to wear goggles, why can't you have unencumbered VR?" She notes that just as in diving, she doesn't mind being encumbered, since the equipment enables her to bodily enter another spatial world. "The oceanic space is probably more related to virtual immersive space than it is to terrestrial space. Here we have gravity, we live on a horizontal plane. In diving there is no gravity, you're in an enveloping space which tends to be vertical. And you can move through that space very subtlely by controlling your own buoyancy with breath. It can be a profoundly serene experience," she says. "We're trying to get away from a lot of the stereotypes that you see in VR, where there's a horizontal floor and you've got all these solid objects — buildings, or whatever they are — in empty space. That aesthetic to me is based on separation of self and world. That's why we're avoiding the probing hand and disembodied eye, instead working with balance and breath, which are visceral and instinctual, and re-affirm the body's central role as experiential ground. And not only does breathing constantly draw the immersant's attention back to his or her own body, as IQ meditation, but it starts to relax them, and coaxes them to let go of the desire to control, the urge to act, and instead slip into a gentle state of 'being' within the space.."
There, on the edge, a clearing in the distance. I exhale and begin to descend into the clearing. Bend my knees and I fly faster. Finally, I am out of the dense forest and into a cozy clearing. Some leaves lie on the ground, a pond, a stream, and a huge oak tree generously giving out its shade for all. I drink it in. I cruise around this area, I want to touch the tree but because I have no physical form, I cannot. I glide up through the leaves of the tree and surround myself with their damp, exquisite beauty. There, look at that leaf I'm going to go right through it! Before becoming involved with 3-D computer technology nearly ten years ago, Char Davies was a painter which explains the painterly sensibility in her work. Having been trained as a visual artist at Bennington College, Vermont and the University of Victoria in British Columbia, she supported herself painting murals and making commissioned paintings of loggers on Vancouver island. This experience led to her making a documentary film about loggers and the forest with the National Film Board in 1981. As other film projects developed, Davies found herself shuttling back and forth between Vancouver and Montreal, pursuing a dual career as filmmaker and painter. Davies was originally a representational painter whose interest in depicting the appearances of things had much in common with Aldous Huxley's inspired vision of seeing "the dharma-body in the hedge of the garden" (Doors Of Perception, 1954). By the early 1980s, however, she had begun to explore her own extreme myopic vision by removing her contact lenses and painting the world she saw with her uncorrected, blurry, vision. In viewing her environment this way, she says, she no longer saw separate objects, but varying spatial regions of luminosity. This created a shift in her work, away from the visually-acute, objective, physical, surface appearance of things, into a much more interior, poetic, symbolic realm. This visual aesthetic — in which distinctions between figure and ground are dissolved, forms become semi-transparent and luminous — has become an essential characteristic of Osmose. "Reproducing external appearances no longer has any interest for me — it is too limiting. Literal illustration reduces meaning to one level, whereas ambiguity offers a richness that can never be exhausted, allowing the work to constantly give back." Inside a leaf. Amazing. Look at this, I'm sliding along the inside of a leaf. There, its veins. Up there, trickles of water molecules making their way down the stem. I hover above them for a moment, trying to see where they exit. Too far to see. I lower myself slightly, directly into the stream of molecules. They are flowing all around me, hugging my form like a thousand tiny angels bidding me welcome. I follow them down the stream, back out the stem of the leaf, back out to the crown of the tree, back out to paradise to a rapid sunset. Day turns into night. A warm glow covers the surface, and I glide over it. Then I penetrate into the ground. In virtual reality academic circles, there is a duality of thought between the naturalists and the postmodernists. The naturalists believe it is better to start designing virtual environments using the physical world as its model. Concepts and new, more conceptual worlds, they say, will develop from there. Post-modernists believe, in true existential fashion, that "physical reality" itself has no definition, therefore to begin designs of virtual worlds based on a physical appearance is misguided, and leads only to restrictions in the imagination of what VR can become. Davies, charting her own route, doesn't follow either school of thought in her work. She believes the issue of "realism" in VR should be a matter of its particular application. "If you want to create models of the human body for surgeons, then I think photo-realism is obviously useful. Or, for scientists creating conceptual models of cells and viruses to understand how they function, for instance, or in teaching a handicapped kid how to manoeuvre his or her wheelchair through virtual streets. Realism in VR has its practical uses — but the predominance of photo-realism and Cartesian space over other ways of seeing and experiencing the world should be questioned. It's based on conventional values which separate subject and object, and further a dominating stance toward the world, an attitude which has contributed to many of our current environmental problems. Thinking of reality only in terms of how a camera reproduces surface appearances is very limiting, and not at all representative of how we subjectively, emotionally, experience being alive." Vegetation and denseness, yet I travel through it as if I am part of the molecules contributing to its makeup. Over there, the root of the tree penetrating into the ground. I see the pond and its stream branching off into infinity. The pond. Cool, clear water. I can't resist — leaning in the direction of the pond, I cruise towards it, the surface of the clearing zooming above me. A moment later I am engulfed in water. It streams up to my face and moves around me, till I'm finally out to the stream. I can hear splashes as I swim submerged. Suspending my movement for a moment, I look beneath me. The pond appears to lead into some tunnel. Putting my arms at my side I exhale and begin a fast vertical descent. In Osmose, the reconstructed body is made possible by the absence of physical metaphors. With no metaphorical hands in front of your face, you become intensely aware of your entire being despite the fact that you have no physical form. Recent trends have been to deny the body altogether, and to celebrate the body as cyborg as nothing more than a marrying of flesh and machine. "That trend is one that I find very alarming," says Davies, "and a lot of people have bought into it. For me, it's important that we reaffirm the body, reassert our materiality, and my intent in using these interface methods in Osmose is to resituate the body in that virtual space." She adds, "I'm not too keen about what we normally see in VR. In terms of its aesthetic, visually and interactively, VR is the epitome of Cartesian desire. A place of the mind, where the body is denied, a place where humans have total control. What we're attempting to do is create a place where the immersant can let go, no longer intent on manipulating, killing, or scoring, but on simply, profoundly 'being' in there, in this enveloping sensuous space. Osmose is a space where people who are stressed out from urban living can become re-sensitized to their own being. For me, this has important ecological implications." Similarly, the sounds in Osmose, which are spatialized and interactive and resonate with all kinds of associations, are derived from samplings of a single male and female voice, which ground Osmose in the body on an even more subliminal level. Green and blue, dark cold walls. I freefall into a dark abyss. Yet what would otherwise be fear is instead a fascinating curiosity. That sound, what is it? Music? No. Animals? No. It is neither, yet it is both. It swirls me like a gentle, lonely funnel cloud, begging me to stay a while. And while I am not afraid, it is not home. I want to go home, back to the clearing, back to the wise old oak tree. Yet still I continue my descent and swoop forward. 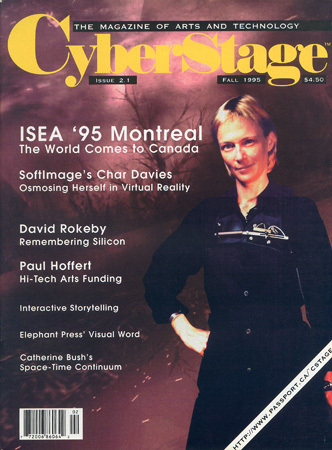 Davies first discovered 3-D computer graphics in 1983 when she saw an animation created by Daniel Langlois, who was later to become the founder of SoftImage. She immediately recognized the technology's potential as a way of getting past the 2-D picture plane of painting into an immersive virtual space, but on Langlois' advice held back from working with computer graphics because the technology was not yet up to what she wanted to do with it. Instead, she continued painting and then joined SoftImage in 1987, a startup venture with, then, three people. She continued her artistic research at SoftImage, incorporating both the aesthetic and themes that she developed as a painter into a series of still images created with the SoftImage 3D animation software. These images were widely exhibited and won international awards. Davies, however, was not satisfied. "Although each of these images was created as a 3-dimensional scene which was then rendered as a still frame, the end-result was 2-D, i.e,. a photographic reproduction. By exhibiting them as large luminous light boxes I was able to convey certain qualities to some extent, but was always limited by the 2-D support. I longed to transcend the picture plane and get into immersive space. But for realtime interactive immersion, I needed to render at 30 frames a second — and my still images took hours and hours to render one frame because of their complexity. So I began looking for alternative ways to express a very similar aesthetic." Davies' team at SoftImage has since developed techniques for rendering environments in three-dimensional realtime by using semi-transparent luminous particles instead of the traditional solid polygonal blocks, techniques which form the basis of Osmose. Letters, like those projected from a computer screen? Lines of programming surround me in big green phosphorous figures. DNA. Building blocks, the construction or sub stratum of this world, lines of code strung together in three dimensions. The actual software that runs the work. I move through them, fly over them, and all the while they play their techy, almost goofy tune. Char Davies exudes a passion as she talks about Osmose, a passion that is reminiscent of a child who has found a new playground. But this childlike fascination is tempered by a very wise adult artist whose drive is to forge new paths for other artistic sensibilities to emerge. In Osmose, she says, "I am seeking an alternative to conventional VR, in terms of aesthetics and interaction, in order to express alternative values and content," adding with a smile that, "… What interests me about this work is that it is so rich conceptually. We plan to continue this research for at least another year and we won't get bored. We've only begun." Then suddenly, the fog, is back. The code begins to disappear. The thick forest. I'm back, back to where I started. Where is the clearing? Where is the edge of this immensity? Deeper I look, faster I go, but still get no relief. Finally, I continue on through, suddenly I am back in paradise. Back to that old tree. I'm home. Davies is at home with VR, for now. "What interests me about the medium of immersive VR is its potential as a conceptual spatial-temporal arena, a place where it is possible to visualize mental models of the world, ideas about what it means to be in the world and then kinaesthetically interact with them through full-body immersion. Our ways of 'being' in virtual space are metaphors for our being in physical space. And I think that's what makes it such a powerful medium, and that's why it fascinates me."